Any given Sunday from August through March, one can typically find 15-year-old Erin Swope whipping-in alongside her father Ben with the Carrollton Hounds. And every Saturday and Sunday after foxhunting season is over, one will most likely find the father-daughter duo at a steeplechase race. 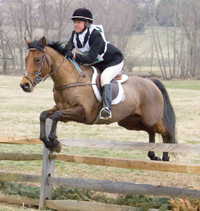 Erin made her first race start aboard Blueberry Muffin at the Howard County-Iron Bridge Point-to-Point Races in the Junior Field Master’s Chase in 2009. She now boasts 70 starts over fences and on the flat with a 44.29 win percentage! Erin has also collected several year-end awards through her years as a junior jockey including the Hopeful Hunter Award and the Junior Foxchasing Award, also awarded as part of the Governor’s Cup Series. One can often catch a glimpse of the South Carroll High School sophomore showing the ropes to new junior jockeys at the races, as well as getting them excited about foxhunting. It is no wonder that Erin Swope was chosen as the recipient of the 2013 Jonathan Kiser Memorial Scholarship presented by the Maryland Governor’s Cup Association. “I always thought it would be amazing if I ever won the Kiser scholarship. Ever since I started racing it has been a goal of mine to someday win it but I never thought it would actually happen! I was absolutely shocked the night of the awards because I had no idea!” Erin said. 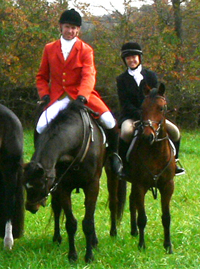 During the 2013 race season, Erin rode in 19 races with three mounts. 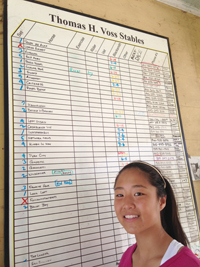 Her race record with her favorite, Jordan, is impressive, with seven wins out of 10 runs. Erin transitioned into horse races with Sweet Talking Guy, finishing second several times. She also rode Ameri Weber to win Restricted Young Adult Flat races at both Orange County and Old Dominion. Erin took full advantage of her Kiser scholarship benefits and found that both the Steeplechase Camp and working for the late Tom Voss to be “amazing” experiences. For most kids in the summer, schoolwork is exchanged for flip-flops and pool time. But for Erin, she rolled up her sleeves and worked harder than she does during the school year! 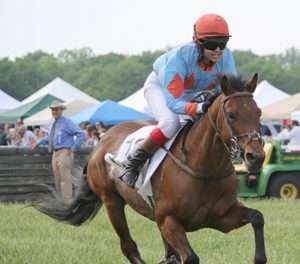 The six-day summer Steeplechase Camp sponsored by the National Steeplechase Foundation and run by U.S. Pony Racing, kicked off in Middleburg, Virginia at Great Meadow, home of the Virginia Gold Cup. Erin was joined at camp by fellow junior jockeys Jacob Crotts (Sumter, SC), Taylor Leatherman (Union Bridge, MD), John Brophy (Oxford, PA), Sabrina Brown (West Grove, PA) and Avery Smith (Baltimore, MD). An instant friendship was formed among everyone in the group. They traveled from Virginia to Butler, MD, Unionville, PA, and Saratoga Springs, NY, working and riding for top jump trainers Neil Morris, Doug Fout, Jack Fisher, Alicia Murphy, Leslie Young, and many more. Days started early, typically at 4:40 am and ended late, but it was all worth it to Erin. 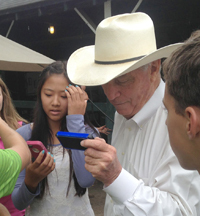 In addition to the country’s top steeplechase trainers, Erin met the legendary D. Wayne Lukas while at Saratoga, getting an up-close look at 2013 Preakness Stakes winner Oxbow and 2013 Eclipse Award winner Will Take Charge. “I picked up some tips from [Mr. Lukas’] riders, like how to hold really strong horses. It was a great opportunity and experience,” remembered Erin, who – thanks to her smart phone – even got to share some Maryland pony racing moments with Lukas himself. The steeplechasing community suffered a tremendous loss with the death of champion trainer Tom Voss. Voss, who was also a mentor to the late Jonathan Kiser, had opened up his home and barn to Kiser Scholars since the scholarship’s inception in 1999.